Son-in-law Joe and daughter Claire below our largest American elm. I remember reading somewhere that planting a tree is one of the most generous expressions of optimism a person can make. Stubborn optimism is surely needed when you propose to do something that requires both muscle and money. Tree-planters invest in a future they are unlikely to witness, yet they do so with the confidence that others will some day enjoy the full glory of a mature tree they helped to plant. Symbolically, planting trees is also a way of “paying forward” to help replace the countless trees that die each year. I started these observations on tree planting and woodland management last summer, but became distracted with other projects. Since winter (what winter?) 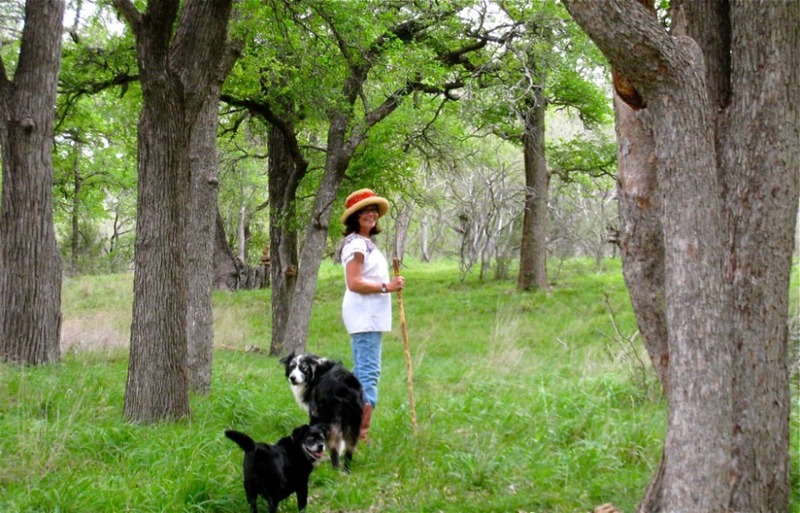 is the best time for planting trees in Texas, I have taken it up again with the hope that planting a tree may provide some consolation to those of us who have been feeling discouraged and beat up by current events, and want to find some way to preserve a few slim, positive feelings about the future. 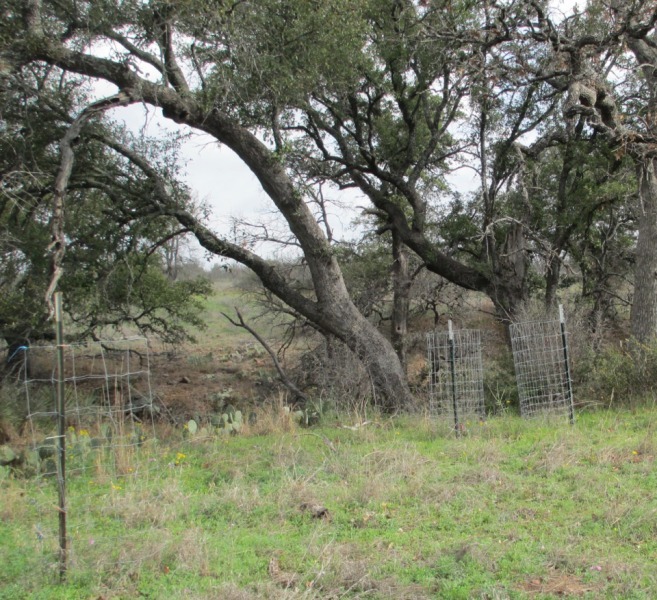 In previous posts, I’ve expressed my concern about the long, slow decline of our woodlands that has been going on for at least fifty years in the Texas Hill Country. 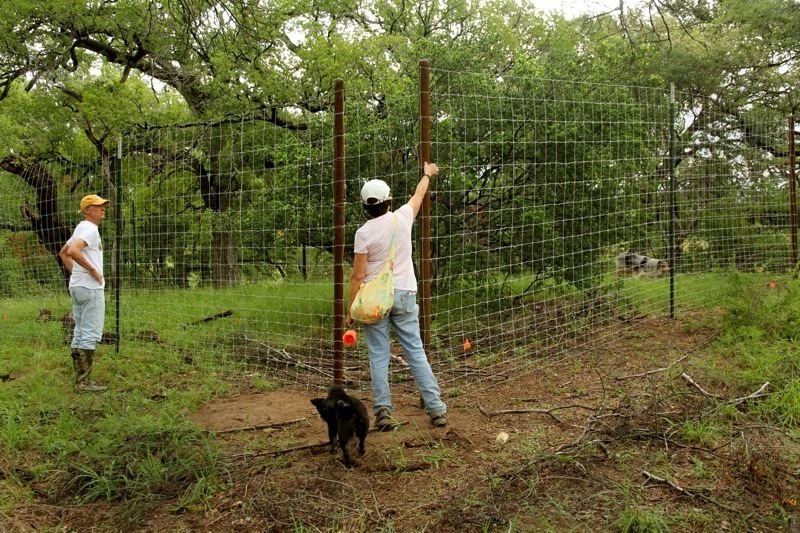 Drought and disease have surely taken a toll, but the main reason that species diversity and decline is so alarming is due to heavy browsing by the over-population of both native and exotic deer. 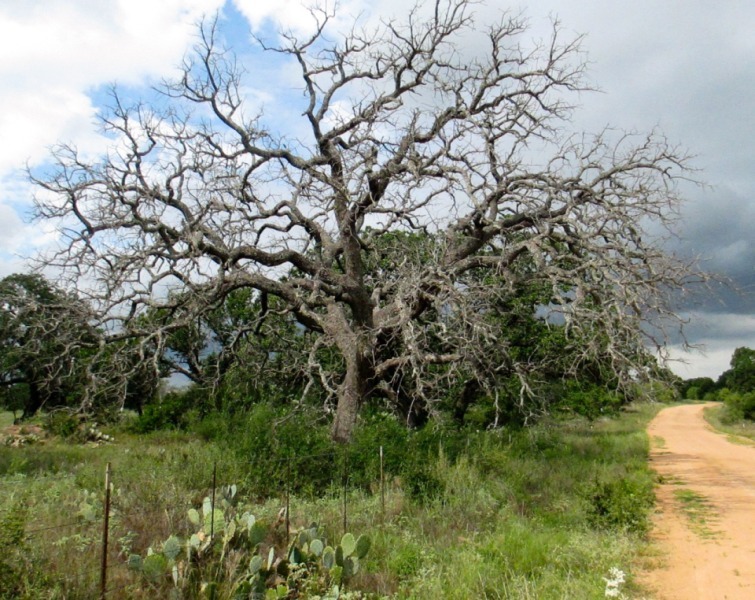 Since the 1960’s when the screw worm was eliminated in Texas, there have been few checks on the burgeoning population of browsers, which means that as you walk through your local woodlands, you may have a hard time finding the next generation of 4, 5, and 10 foot trees mixed in with aging mature trees. 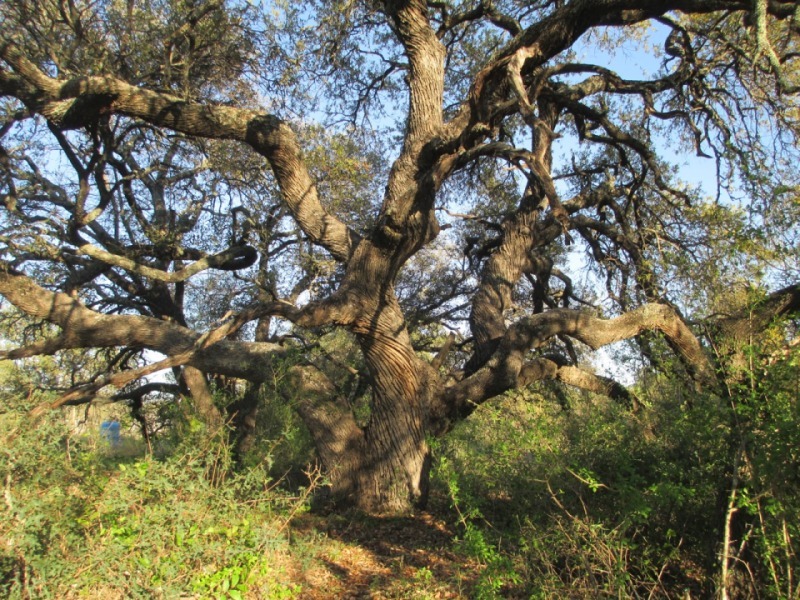 Over-browsing has significantly reduced diversity as well, leaving most woodlands dominated only by live oaks, mesquites and fewer cedar elms. Where are the cherries, post oaks, red oaks, elms, and redbuds that used to be easier to find? 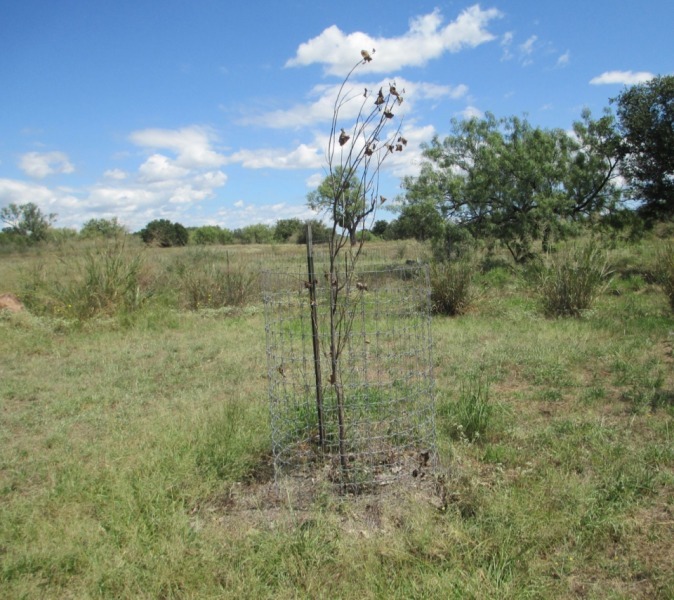 On our place in SW Llano County, we have begun to protect our naturally occurring seedlings with cages or brush corrals. In some places we have enclosed larger groves in order to visually verify the changes in plant composition from open browsing to protected spaces. If we notice significant positive changes over time, we may enclose more areas to help encourage more diversity. 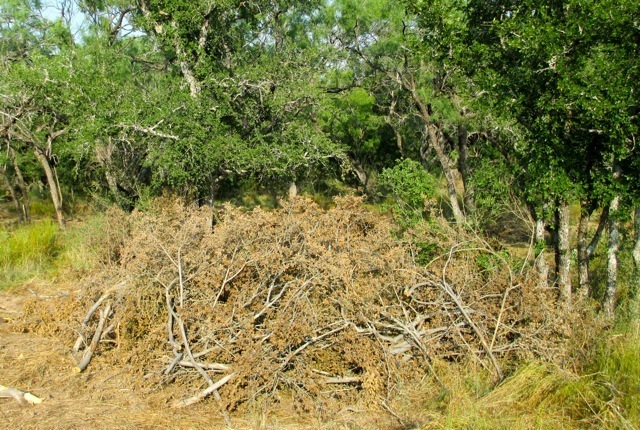 We also continue to selectively remove brush to create gaps in closed thickets of white brush, prickly pear, and persimmon where natural germination is smothered out. Experimental efforts to plant acorns and small seedlings without providing irrigation have been futile, given the changes in our climate patterns and ever-rising temperatures. The second part of our tree-planting program is to plant trees where we can reach them with a hose. (note: we are not ambitious enough to try to carry water on a regular basis to trees in remote locations. In most cases, a nursery-gown tree will require water every summer to ensure survival.) Each year we plant five trees, and feel lucky if three survive. We try to select species that should be found on our place, but have been browsed out, and also trees that could potentially produce seeds and/or fruits that could be spread by birds or mammals – again hoping to add diversity. Cottonwoods are one of my favorite trees, yet they have mostly been browsed out altogether from the Texas Hill Country. I love the way the leaves tremble and dance in the summer wind. Because cottonwood trees can grow up to 100 feet tall, they are not well-suited for planting in a residential landscape, but they are excellent trees to introduce into a rural location. Foresters tell us that cottonwoods are one of the most important wildlife trees in the Western U.S. Eagles, raptors, woodpeckers, turkeys and owls use broken-topped or large branches for platforms, and the hollow cavities provide important nesting places. Cottonwoods are easy to root, and are very important in restoring stream banks, and enhancing riparian areas. Cottonwoods are softwood trees, and are susceptible to fungal disease, and often “self prune” as a result, dropping branches and leaves constantly, thus driving many homeowners to reach for the chainsaw. Yet the snags and decayed branches are home to many insects and mammals –in short, a cottonwood is a whole ecosystem in itself. In 2014, we were lucky to buy five small five-gallon trees from a local nursery and we planted them immediately. Check with your nursery to see if they can order cottonwoods for you from backyard or boutique growers, or a local native plant sale. 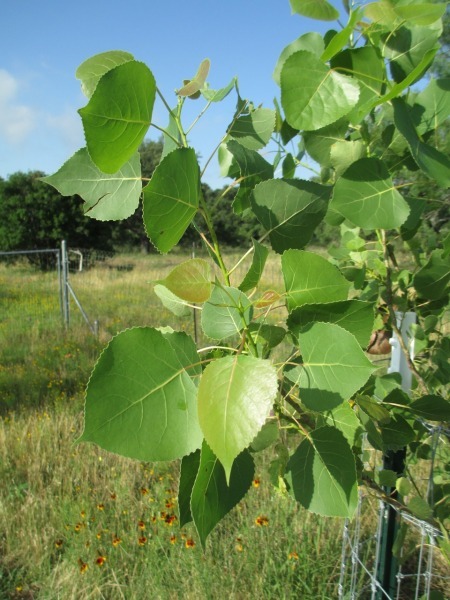 You are not likely to find cottonwoods at the big chain nurseries. 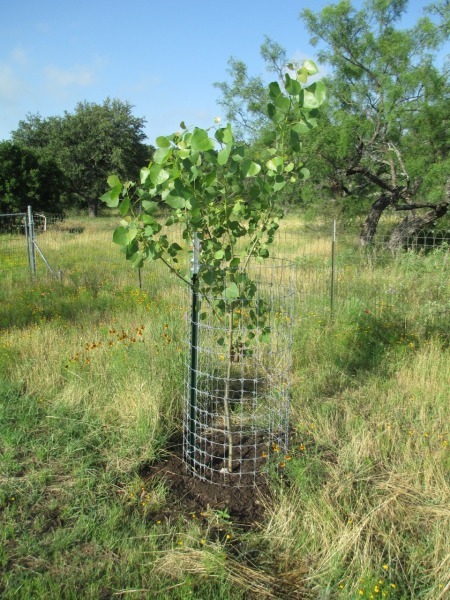 Although one cottonwood tree did not survive the first year, the others quickly began to take on new growth and extend beyond their enclosures. Now here comes the next part about planting trees: how difficult it can be to get them established. 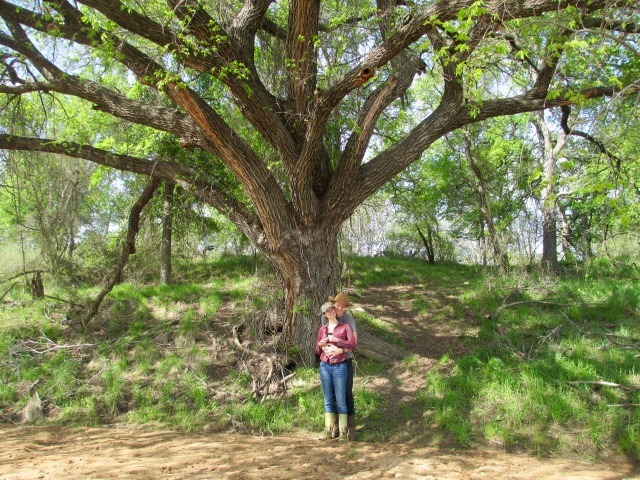 One week in July our largest cottonwood was robust with glossy leaves and many new branches. The next week, the tree looked like it had been burned by a propane torch – a sure sign of phytophthora fungual disease. The over-saturated conditions of the 2017 spring followed by a “flash drought” from June to October, provided ideal conditions for this common soil-borne fungus. There are few pathogens that will shut down a vascular system faster than phytophthora fungus to suddenly overwhelm our young tree. It’s action is so quick, that by the time you notice something is wrong with your tree, it’s too late. 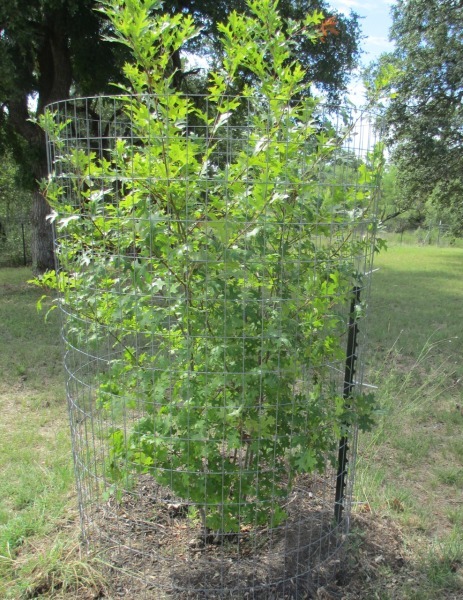 Phytophthora has also affected several Texas red oaks (Quercus buckleyii) we have planted over the last several years, but it only killed the top trunk and stems, and soon slender root suckers appeared, indicating that the tree was still alive. It’s disappointing to have the dominant shoot replaced by several stems, all of which are vying for apical dominance, or to survive as the strongest central trunk. Observing our recovering trees, I recalled how many naturally occurring red oaks have multiple trunks. I wondered if this setback caused by disease could also offer some benefits over time by driving the energy of the tree back down into the roots to further strengthen and anchor itself deep in the ground, delaying the height of the tree but also resulting in a broader, stronger canopy and more resiliency over all against drought. A forester once told me that many of the recorded “champion” trees were ones that were either struck by lightning when young, browsed down while in the seedling stage by rabbits or other grazers, or top-killed by disease or wind. That got me noticing some of the older, stout trees on our property, and how the main trunk forks closer to the grounds, resulting in a broad base. Could this have happened to them? For now, we will continue to care for those stunted, small seedlings that suffered this kind of early set back and see what they become. Won’t you plant a tree, too, before summer? Dig a generous hole, make sure the roots are not too tangled up and tightly coiled in the container, give them a little compost, a cage, lots of mulch and water every summer, and in that way, send a little hope for the future of all of us.